The KM3 is the new flagship converter from Thermoelectric Conversion Systems. It builds on the reliable performance of the KM2 converter, considerably expanding input and output operating range and power rating. A proprietary algorithm ensures top-level MPPT performance during both transients and steady thermal conditions. An optional touchscreen display shows input/output current and voltage measurements. Have a look at the KM3 datasheet! The KM3 converter is a Maximum Power Point Tracking (MPPT) converter for thermoelectric power generating arrays (TEGs). It operates the TEGs at their optimal operating point and efficiently transfers electricity to the necessary output battery (not included). Battery charging management can be activated to improve the state of charge of the output battery. 12V and 24V batteries are currently supported and 48V batteries will be supported from the beginning of 2018. The proprietary MPPT algorithm tracks fast thermal transients and recognises steady states to increase the thermal-to-electrical efficiency of the system. The KM3 converter interfaces TEGs whose voltage can be either lower or higher than that of the output battery. It starts its voltage step-up operation with input voltages as low as 2V and continues harvesting electrical power provided that the TEG open-circuit voltage does not exceed 85V. The KM3 converter uses synchronous rectification to operate in Boost, Buck-Boost or Buck modes. Its innovative construction design minimises heat dissipation and EMI and allows extremely high power densities. 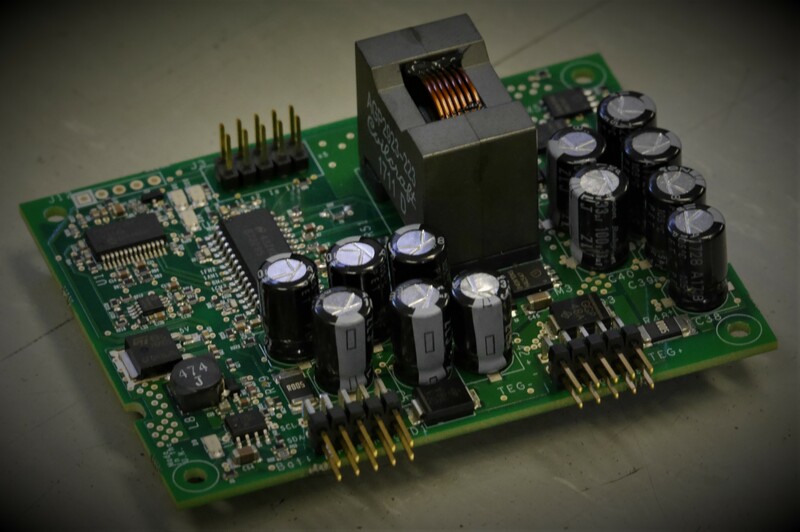 No external heat-sink is required and all components are mounted on the top-side of the PCB. The KM3 converters can communicate to other devices through I2C. It answers to an I2C master using the TCS communication protocol, based on the PMBus protocol. An optional touch-screen display shows input and output voltage, current and power and controls the operation of the converter.